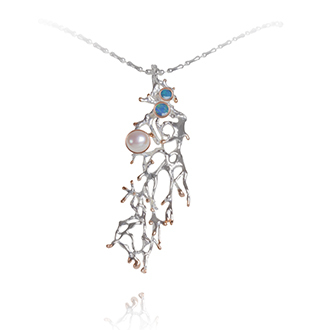 A large solid sterling silver statement pendant with 18 karat rose gold accents featuring Australian doublet opal, and pearl. Also available in blue topaz, and peridot. Keiko Uno’s Sway with Me series is inspired by the magical dance of coral and marine life to the rhythms of the sea. The Sway with Me series forms part of Keiko Uno’s luxury sterling silver Rockpool Collection.